The synchronous fireflies at Elkmont have started again this year with their almost unique pattern of flashing on and off in harmony – a thing not seen anywhere else in the world except parts of Southeast Asia. The Park Service is again coordinating a trolley service in conjunction with the City of Gatlinburg to bring people to the Elkmont campground area for the nightly showing. For safety and environmental protection, visitors to the area are limited. Advance tickets go on sale in April and usually sell out in ten minutes! 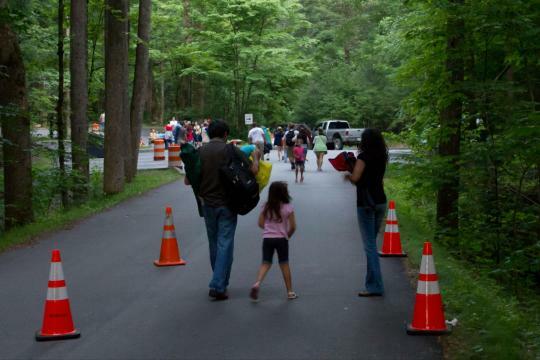 But the Park also offers daily tickets – this year 85 each day – available online for purchase the day before. Tickets go on sale at 10 am and are snapped up FAST – so be warned. For details and to purchase go here. The viewing season this year is June 2 – 9, 2015. However, local hiker and writer Christopher Hibbard reported on Twitter that he saw the display at Elkmont already on Thursday night, May 28. 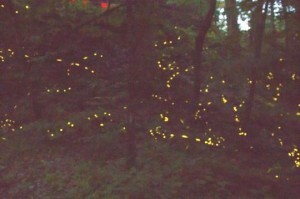 The synchronous fireflies can be seen in other areas of the Park, both before and after the peak dates predicted by the Park Service, as well as several places along the Southern Appalachians. Typically it takes an experienced hiker to get to the good places, and capacity for visitors is small. The Elkmont location is optimal because it’s one of the nicest areas in the Park, as well as supplying prime conditions for the fireflies. And it can handle the 1,000 people per evening that typically come to watch this rare event. 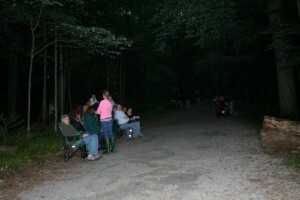 The camping area itself is usually booked months ahead for the firefly viewing. The firefly show is an elusive event. Rainfall can literally put a damper on the light activity (and there’s rain this week, on and off). And it’s extremely difficult to capture the phenomenon on camera. This is one of those magical events that you have to be present to experience. 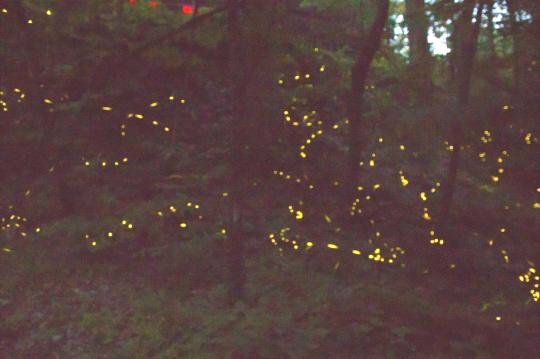 Many people try, and many people do manage to see the synchronous fireflies of the Smoky Mountains. Good luck, and if you get to see it and – even more rare – get a picture or video of it, be sure to share it!